Welcome to Life Coach Radio. My name is Jeff Wasserman and I am a professional Life Coach. 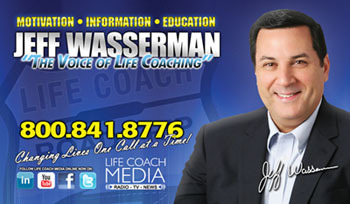 You may have found the Life Coach Radio site surfing the web or seen the new Life Coach Bus. Either way, I am glad your here. Today's media selection is endless, webcast, podcast, itunes, terrestrial radio, satellite radio, internet radio and the list goes on and on. My life dream was to be a business owner by day and talk radio host at night. I have been involved in the Life Coach profession since the late Thomas Leonard transformed a skill set or modality into a field of professional practice. He is credited for creating the Life Coaching profession. I hosted a call in talk radio show for several years on WGUN 1010 AM in Atlanta many years ago. Since that time, I see a need for a national marketing plan for Life Coaches. I have watched as many of the large coaching organizations and communities steered the profession in different directions. I know you can listen to many different talk shows on the radio, internet and even satellite. Most shows deal with one topic or another. my new show, Life Coach Radio Show, just like Life Coaching, deals with you, and everything about you. I will talk about about your life, dreams, relationships, love, happiness, health, fitness, careers, family, investing, opening and operating a small business and of course YOU. I will discuss most everything that makes you so unique and special in this world. I leave the political and religious discussions for the other talk show hosts. If you are looking to explore your authentic self, to find out more about you, need help making a tough decision or a new direction when dealing with a major life altering challenge, please call my show or stop and visit us on location with the new Life Coach Bus. We will only send one or two email newsletters per month. If you own or manager a business in the Atlanta area, and wish to have the Life Coach Bus visit your business, free of charge, please call Sarah at 1-800-876-8441. We are currently looking for locations to set up and broadcast our radio show. The Life Coach Bus will create interest and excitement, giving your business more exposure without any cost. Your business will be listed on the this website as well as pictures will be included in the photo gallery section. We are looking for locations for the fall of 2012. Jeff is creating the most exciting and innovative concept the Life Coach profession has ever seen. Jeff is using his 30+ years of Media and Marketing experience to change Life Coaching forever. If you are interested in Life Coaching, please check out the Life Coach Radio Blog and the Life Coach Media Blog. You will see how Life Coaching can help you get more out of life. Allow Life Coaching to touch your life and see the difference it can make. If you are a Life Coach and disillusioned by the difficulty in finding clients, maybe your frustrated with the national and international coaching groups, now may be the time to join with Jeff and become a state representative for the US Life Coach Association. Looking for professional Life Coach Training, check out Life Coach College, where coaching is not just theory, it is a way of life.